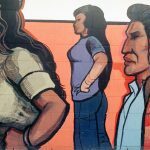 Remembering the Zoot Suit Riots – ¡Murales Rebeldes! 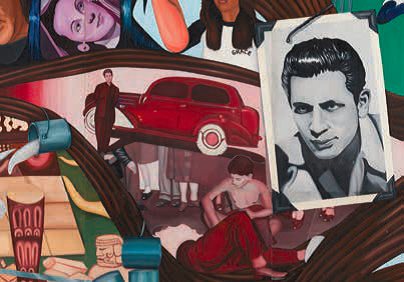 Mural detail, Zoot Suit Riots, Barbara Carrasco, L.A. History: A Mexican Perspective (1981). 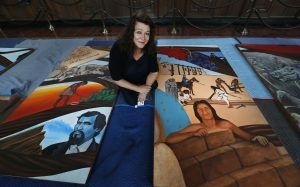 Courtesy California Historical Society / LA Plaza de Cultura y Artes; photo: Sean Meredith. During World War II, a cultural war smoldered on the streets of Los Angeles. 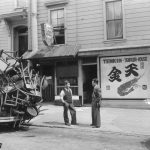 The wartime fear that swept across the country, resulting in the forced incarceration of West Coast Japanese Americans, reached other L.A. minority communities. In June 1943, this atmosphere of tension exploded in more than a week of fighting between white servicemen and primarily Chicana/o youth. “Whites Only,” 1942. Courtesy www.csusmhistory.org. 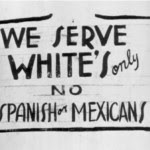 Racial sentiment against Latinos had existed before the war, certainly. But wartime restrictions—including rationing of fabrics used to manufacture clothing popular among Latinos, African Americans, and Filipino/Filipino Americans—appeared to exacerbate it. Zoot Suit Wearer, 1930s. Courtesy mortaljourney.com. “As the war furthered the dislocation of family relationships,” Cosgrove explains, “the pachucos [migrant youths dressed in zoot suits or in attire influenced by them] gravitated away from the home to the only place where their status was visible, the streets and bars of the towns and cities.” There the pachucos sported zoot suits, pork pie hats, and dangling watch chains—easily identifiable in a city already wary of and hostile to them. The Progress of Rioting, 1943. Published in Eduardo Pagan, Murder at the Sleepy Lagoon: Zoot Suits, Race, and Riot in Wartime L.A. (Chapel Hill: University of North Carolina Press, 2003). By 1943, Southern California was teeming was servicemen. PBS has described the region “as a key military location with bases located in and between San Diego and Los Angeles. Consequently, up to 50,000 servicemen could be found in L.A. on any given weekend.” Clashes among servicemen and L.A.’s largest minority group—some 250,000 Mexicans (including Mexican Americans, many of whom had enlisted in the military)—are summarized in the following PBS timeline, enhanced for this blog with primary source images and accounts. 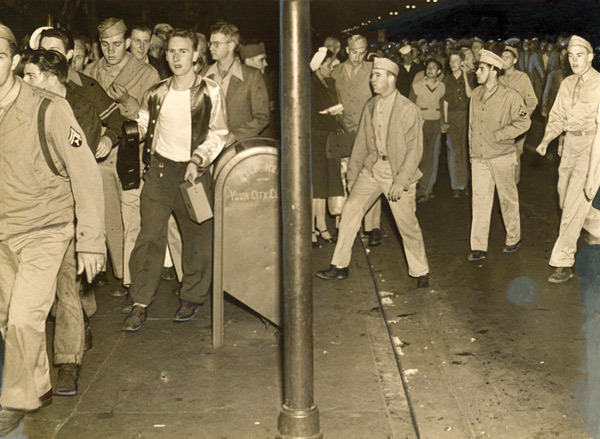 Uniformed servicemen rioted throughout Los Angeles, targeting young men in zoot suits, 1943. Courtesy of the Los Angeles Examiner Collection, USC Libraries. Spring: Clashes between servicemen and Mexican American youth occur up to two to three times per day. May 31: Twelve sailors and soldiers clash violently with Mexican American boys near downtown. Seaman Second Class Joe Dacy Coleman, U.S.N., is badly wounded. U.S. armed forces personnel with wood clubs on street during “zoot suit” riot, Los Angeles, 1943. Courtesy Library of Congress. 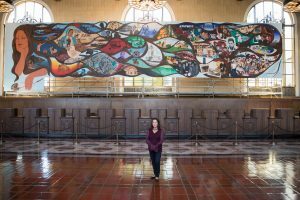 Fresh in the memory, of Los Angeles is last year’s surge of gang violence that made the “zoot suit” a badge of delinquency. . . . Although “zoot suits” became a uniform of delinquency because of their popularity among the gangs, their adoption by some of the city’s youth was more a bid for recognition, a way of being “different,” in the opinion of Heman G. Stark, County Protection Office chief of delinquency prevention. Stark and Superior Judge Robert H. Scott of Juvenile Court concur in the belief that the formation of gangs was an outgrowth of a feeling of inferiority on the part of minority groups. U.S. military personnel stopping a streetcar while roaming the streets of Los Angeles in search of zoot-suiters, June 1943. AP Images via www.britannica.com. Policemen, servicemen, and civilians patrolling the streets of Los Angeles, 1943. Courtesy forum.skyscraperpage.com.
. . . zoot-suits smoldered in the ashes of street bonfires where they had been tossed by grimly methodical tank forces of service men. . . . The zooters, who earlier in the day had spread boasts that they were organized to ‘kill every cop’ they could find, showed no inclination to try to make good their boasts. . . . Searching parties of soldiers, sailors and Marines hunted them out and drove them out into the open like bird dogs flushing quail. Procedure was standard: grab a zooter. Take off his pants and frock coat and tear them up or burn them. Trim the “Argentine Ducktail” haircut that goes with the screwy costume. 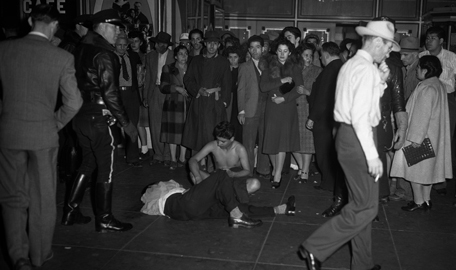 Police stand by as Zoot Suit wearers are beaten and stripped of their clothes, 1943. Courtesy messynessychic.com. 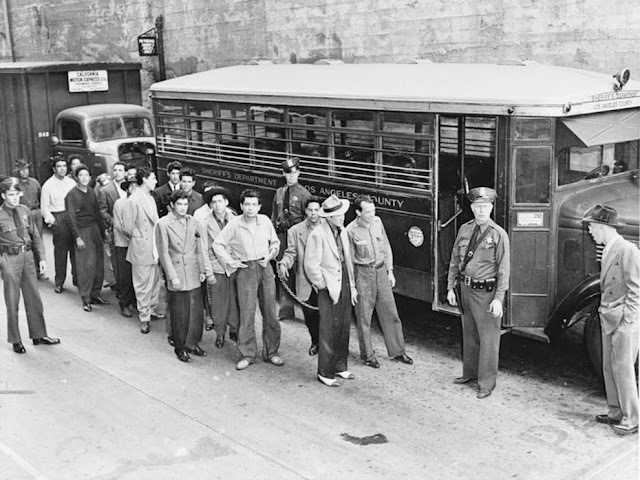 June 4: Rioting servicemen conduct “search and destroy” raids on Mexican Americans in the downtown area—whether their victims are wearing zoot suits or not. The servicemen employ twenty taxis to look for zoot suiters. 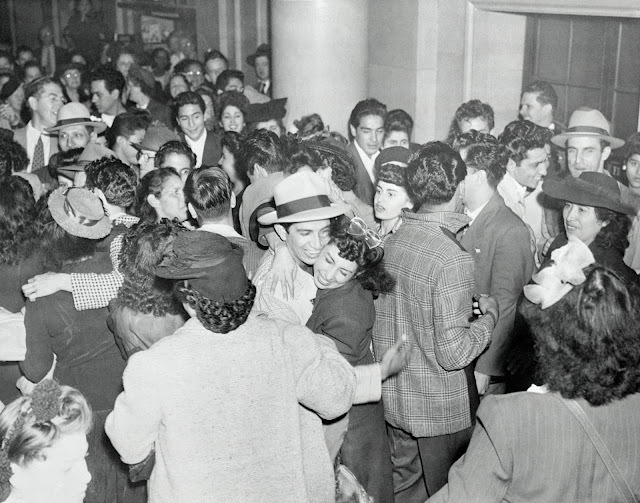 June 5: The rioting continues with attacks on all “pachuco”-looking males. A group of musicians leaving the Aztec Recording Company on Third and Main Streets are attacked. Attorney Manuel Ruíz and other Mexican American professionals meet with city officials. Carey McWilliams calls California Attorney General Robert Kenny to encourage Governor Earl Warren to appoint an investigatory commission. “Zoot Suiters” under Arrest in Los Angeles, 1943. Courtesy Library of Congress. 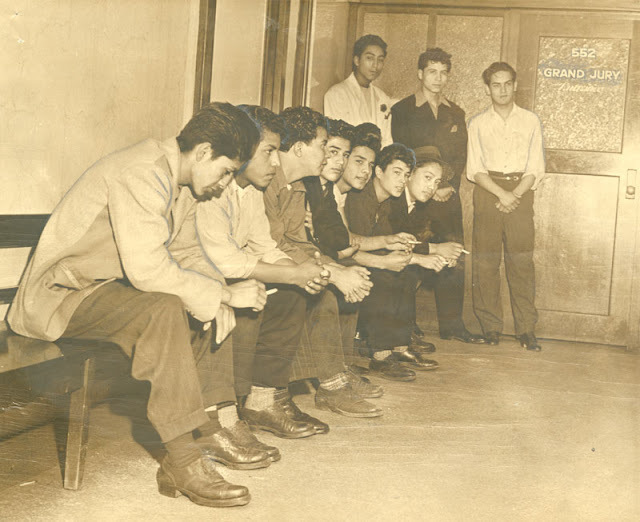 Mexican American youths detained for questioning, 1943 Courtesy Department of Special Collections, Charles E. Young Research Library, University of California at Los Angeles. Copyright UC Regents. 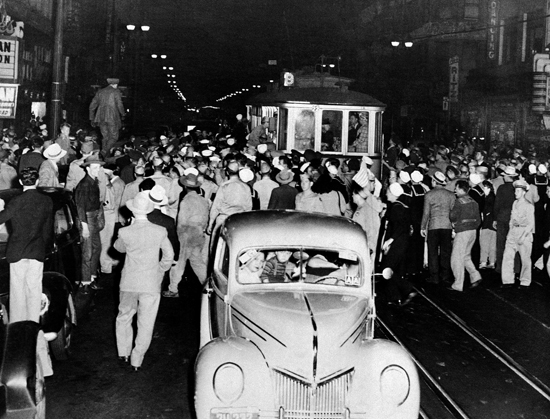 Marching through the streets of downtown Los Angeles, a mob of several thousand soldiers, sailors, and civilians, proceeded to beat up every zoot suiter they could find. Pushing its way into the important motion picture theaters, the mob ordered the management to turn on the house lights and then ran up and down the aisles dragging Mexicans out of their seats. Streetcars were halted while Mexicans, and some Filipinos and Negroes, were jerked from their seats, pushed into the streets and beaten with a sadistic frenzy. 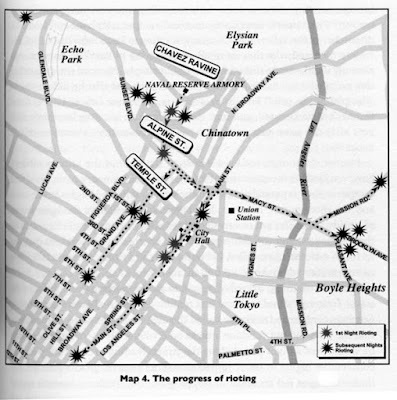 June 6: The rioting escalates and spreads into East Los Angeles. Kenny meets with McWilliams regarding the investigation and creates the McGucken Committee. Chaired by the Auxiliary Bishop of Los Angeles, Joseph T. McGucken, the committee blames the press for its irresponsible tone and the police for overreacting to the riot. June 7: The worst of the rioting violence occurs as soldiers, sailors, and marines from as far away as San Diego travel to Los Angeles to join in the fighting. Taxi drivers offer free rides to servicemen and civilians to the riot areas. Approximately 5,000 civilians and military men gather downtown. The riot spreads into the predominantly African American section of Watts. 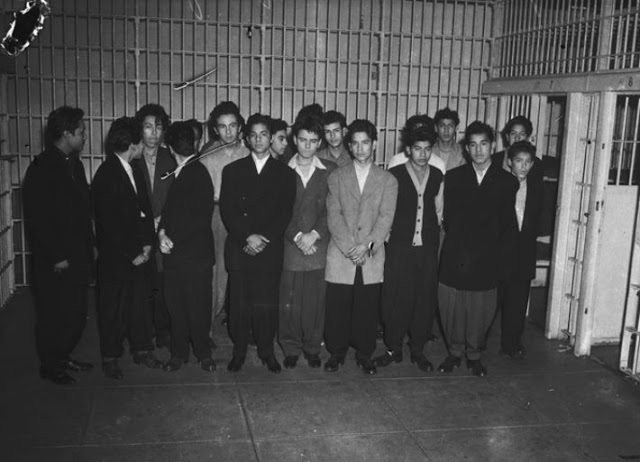 Alleged leaders of Zoot Suit groups before the County Grand Jury, 1943. 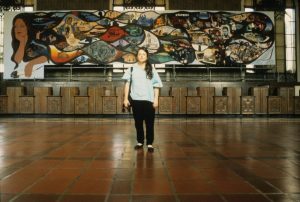 Los Angeles Public Library, Herald-Examiner Collection. 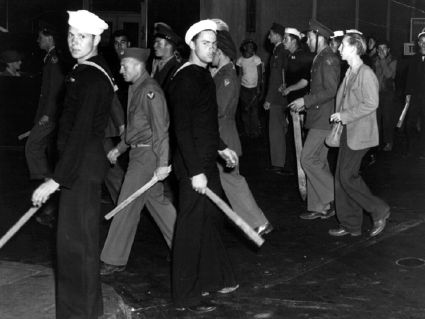 June 8: Senior military officials bring the riot under control by declaring Los Angeles off-limits to all sailors, soldiers, and marines. The Shore Patrol is under orders to arrest any disorderly personnel. 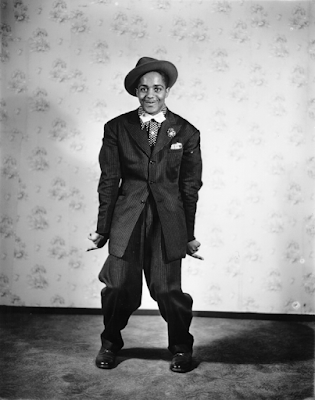 The Los Angeles City Council passes a resolution banning the wearing of zoot suits in public, punishable by a 50-day jail term. June 9: Sporadic confrontations continue, but not at nearly the same intensity. 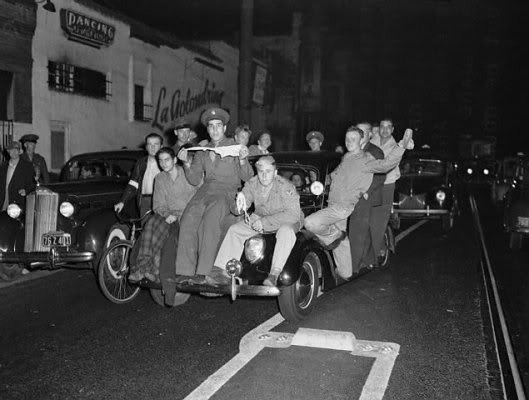 Zoot suit rioters celebrate after they are acquitted, October 26, 1944. Courtesy kcet.org; photo: Bettmann/Getty Images.